Disclaimer: I am not a Rabbi and my pitputim on Halachic matters should always be viewed as such: not להלכה and not למעשה. In all instances, I recommend investigating the issue yourself (if possible) and then approaching your local orthodox Rabbi. Are you permitted to make plunger coffee on shabbos? I was asked this question a while back. The term “plunger coffee” isn’t universally known. The device is more commonly known as a French Press. Water poured from the כלי שני into a second dry cup is considered a כלי שלישי a ternary source, and such water is not considered halachically capable of cooking, as mentioned above. This water can, it would seem, be poured onto roasted ground coffee at the bottom of the plunger. There is another consideration in respect of the ground coffee. Halacha defines a concept called קלי הבישול these are food items that are eminently susceptible to cooking. The הלכה of קלי הבישול is a גזרה Rabbinic decree. The Gemara lists foods that are not susceptible: meat (as opposed to chicken), salt, spices, water and oil. According to some ראשונים (notably the יראים) anything which the Gemorah does not list is considered as קלי הבישול. This is also the opinion of the משנה ברורה. Some opinions, such as the חזון איש, contend that any food that our eye sees is cooked very quickly should pose a halachic concern. In other words, the issue of קלי הבישול is one of מציאות according to the חזון איש and others. What sets קלי הבישול apart is that they are deemed to become halachically cooked even in a secondary source כלי שני. Notwithstanding this, it could be argued that since coffee beans have been roasted (and thereby undergone a halachic process of cooking prior to Shabbos) they are not considered קלי הבישול. Some Poskim allow קלי הבישול in a כלי שלישי while others do not. As an aside, an interesting question pertains to spearmint or peppermint tea leaves which are generally considered קלי הבישול as they are unprocessed from a cooking perspective and are either susceptible to easy cooking or not listed in the גמרא. There are authorities who allow קלי הבישול in a ternary source, a כלי שלישי. Others, such as the חזון איש and חיי אדם disagree. The point of disagreement relates to how we view the process of halachic cooking. If we look at it as a מציאות a quasi-scientific observation, then there ought to be no difference between a כלי שני and a כלי שלישי. On the other hand, if we look at it as a pure דין in בישול then there is a difference between the כלי שני and כלי שלישי perhaps on account of the latter being removed from the a halachic definition/concern of cooking. The Rav was of the opinion that the הלכה of כלי שלישי is derived from דין and is a pure halachic determination as opposed to an observational phenomenon מציאות that might otherwise lend itself to scientific conjecture. The next issue that needs to be considered is the one known as בורר selecting. The laws of בורר are very complex and also apply to non-food stuff. On both Shabbos and Yom Tov (although the latter has some leniencies close to a meal/consumption) the הלכה permits the removal of the desirable from the undesirable. If someone removes the undesirable from the desirable, however, then the הלכה considers this to be forbidden as an אב מלאכה a primary shabbos Torah prohibition. An example close to the one we are looking at. Consider an old-fashioned tea-pot which is sitting on the shabbos blech or a covered source of fire. The pot contains tea leaves and water. Over time, the tea leaves tend towards the bottom of the pot. As the water boils the tea essence seeps into the liquid. The tea leaves themselves are undesirables; people do not eat them. Assume this pot was placed on the blech on Erev Shabbos on a low heat with the intention of drinking freshly brewed tea at the end of the friday night סעודת שבת meal. Nobody wants to find bits of undesirable tea leaves in their cup. Is there a permitted way to serve the tea without the leaves. This question was particularly burning (sic) before the advent of tea bags. Based on the above, one is forbidden to remove the undesirable tea leaves from the desirable tea essence/brew. This is בורר. So, if there was a thought of inserting a big spoon to removing only the tea remnants and subsequently placing the pot on the table so that people can be served, this is not allowed. On the other hand, if the desired liquid/essence/brew is removed from the pot, and the tea leaves remain in the pot, then one is separating the good from the bad, and separating the good from the bad is permitted and not בורר. To enable separation of the good liquid from the bad tea leaf remnants, some pots have a spout which contains a wire mesh. As one pours, the wire mesh prevents any tea leaves that have risen from leaving the pot and thereby facilitates a permitted form of separation. This is the opinion of the חזון איש in הלכות שבת סימן נ’ג towards the end . The חזון איש if I have understood him correctly, feels that since there remains a mixture of some liquid with tea leaves (at the bottom of the pot) effectively, the liquid that emerges through the spout is a separate entity and only if the leaves were floating all about and hadn’t settled would this technically be forbidden as בורר. On the other hand, the Sefardic posek, the בן איש חי (parshas Beshalach 18) prohibits this methodology. The reason for the בן איש חי is that the actual tea-pot contraption which includes the mesh, is considered a specific vessel for the purpose of separation, כלי המיוחד לבורר. Sefardim generally follow the בן איש חי although Rav Ovadya sometimes disagrees with him and has the broad shoulders to do so. In the case of a coffee plunger, we are confident that the coffee will be consumed almost immediately after being poured from the plunger. The more vexing question is whether the device per se can be considered by hand. Chazal proscribed the use of an implement כלי המיוחד לבורר. Use of a specific device falls under the rubric of עובדין דחול and is a Rabbinic prohibition as opposed to the act of separation בורר which is a Torah prohibition. At first and second glance it would seem that clearly the handle of the plunger, with its attached mesh screen, is a classical כלי המיוחד לבורר device for separation and should be prohibited, at least Rabbinically. This is the opinion of R’ Moshe Heinemann, the Posek of Star K, based on my communication on this issue. Tangentially, R’ Moshe Heinemann is also the long-term Posek consulted by Melbourne’s Lakewood Rosh Kollel for non-standard questions. A respected Posek, Rabbi Heinemann was the author of the controversially lenient Psak regarding Shabbos Ovens (for Yom Tov use) which was the target of Rabbinic protest. I have some questions on R’ Heinemann’s view regarding the French Press. For the stem to be considered a prohibited בורר device it would seem to me that one has to first ascertain that the stem is being used for בורר. If the stem is being used for something that is permitted, then in my limited understanding the device doesn’t fall under the category of עובדין דחול. Consider two distinct stages in the birth of the final coffee product. The first is when the stem is pushed down into the glass press, thereby forcing the ground coffee to the bottom of the glass. What act is being performed during this stage. In my opinion, this is an act of סילוק diversion/casting aside. The coffee is moved down to the bottom, but at no time does has it become separated from the coffee liquid above. For there to be an act of בורר, I understand that the undesirable needs to be removed from the desirable. I would argue that it has not been removed, but has been forced into a new section of the glass environment. I have mentioned my סברה to some local Rabbis and haven’t yet received a rejoinder. The next act involves the pouring out of the liquid into the coffee cup. This is certainly involving the desirable leaving the environment of the undesirable through the act of pouring whilst aided and abetted by the static barrier of the screen. I am working on the assumption that the plunger is pushed down in a way that there is always some liquid remaining together with the lower section of ground coffee even after the top most liquid has been poured into the coffee cup. Following my logic סברה, we are perhaps now in the same situation as that described by the חזון איש in respect of the tea-pot with the mesh screen at the spout which the חזון איש permits on Shabbos. In discussion, I learned (I haven’t seen this inside) that the ארחות שבת testifies that many have difficulty understanding the permissible ruling of the חזון איש (which as I said above is not the view of the Sephardic בן איש חי. I saw the בן איש חי quoted in ילקוט יוסף when I was in the Sephardic Singapore Shule a few months back—ילקוט יוסף is an amazing sefer). The ארחות שבת goes onto quote R’ Shmuel Auerbach (one of the sons of the late and great R’ Shlomo Zalman Auerbach ז’ל) to the effect that R’ Shmuel cannot understand the lenient opinion of the חזון איש and feels that since we are dealing with a ספק דאורייתא Torah doubt, we should be מחמיר and forbid the tea-pot/strainer device. For reference, Rav Aviner does permit a coffee plunger on Shabbos and agreed with my reasoning (I didn’t send all my thoughts at that stage). Rav Heinemann doesn’t permit it, as described above. Rabbi Michael Broyde in a series of communications to me, contends that there is a problem of בישול even in a כלי שלישי because following the roasting of beans, they are not edible. I’ve been back and forth with him on this, but I’m not sure I fully understand Rabbi Broyde’s reasoning. The famed Eretz Chemda sent me the following (at that stage, I hadn’t sent them my fuller analysis including the חזון איש). The Shulchan Aruch (Orach Chaim 319: 10) writes that it is permissible to filter on Shabbat something that must people do not bother filtering. This applies even to one who would not drink without filtering. Some say that use of the French press is comparable to this citation in the Shulchan Aruch and therefore may be used on Shabbat. Nevertheless, this is on condition that one waits the duration of time in which the majority of coffee grounds will become submerged in the water and only a few coffee grounds will remain. However, some Rabbis say that the cited halakha applies only to drinks that most people don’t mind drinking what is being filtered. But in the case of coffee, many drink without filtering, but none drink the actual grains, and therefore the use of the French press is prohibited on Shabbat. The reasons that you mentioned are good reasons. However, they’re insufficient. First of all, the Issur that we’re dealing with is Meshamer , not Borer, that applies regardless of what is being removed. Secondly, pressing the grains down is considered removing the waste material. The fact that a bit of the waste remains isn’t enough, since the removal is what rendered it drinkable. One can be lenient and place them into a third-degree vessel. Despite the Ramah’s stringency stating that there is cooking after baking and roasting lechatchilah in a secondary vessel, the Mishnah Berurah (sif katan 47) writes that everyone agrees that it is permissible in a third-degree vessel. There is no practical difference between coffee grounds and a large item. I’m not sure I still understand what Eretz Chemda are saying vis-a-vis משמר versus בורר because the act occurs inside the vessel with everything still joined. That is likely to be my lack of understanding. If any of you have asked this question before and/or have some contributions to make to the topic, I’d love to hear from you. I will ask Rav Schachter soon. I’m not expecting that he will permit it. Thanks Stephen. I look at it this way. See how incredible Judaism is: you only want to have a cup of plunged coffee and it sends you on a journey of intellectual discovery! You could try an over-the-cup filter, which might alleviate the problem of borer as passing water never becomes a mixture. I actually drink instant on Shabbos … This is of theoretical interest to me. May I ask what brought this post on? Well, as you know, I don’t drink much coffee anyway myself. On Shabbos I occasionally indulge in a coffee and am happy enough for instant. I stopped drinking coffee because it made an already hyper person, super hyper, and I figured it might be good not to project into the stars via copious coffee. I was asked this question by a cousin’s husband as well as my sister, and I simply enjoy learning and the process of trying to nut out what the Halacha might be. I hadn’t thought about this before, but yes: you do present as someone who has just had a triple-strength espresso and consequently is full of energy and bonhomie. I am somewhat alarmed to discover that this is actually inherent. Anyway, two observations: firstly, is R’ Broyde aware that people do eat chocolate-covered coffee beans, and would this change his position? I suppose you could argue that the chocolate covering makes them palatable (as it does), but I can’t see why this would make them more susceptible to bishul. Secondly, does your distinction rely on the fact that coffee is a liquid? What if someone made a sieve for grain that worked like a French press, pushing chaff and a small amount of wheat to one side of a container. Intuitively, this would be forbidden; why would a French press be different? I’m not sure I understand the מציאות of your example. Certainly Borer occurs with solids. Solids present some conjecture though in respect of their size and the so called connectivity between the different solids. סילוק would assume there is no use of the mesh to somehow effect a physical change in one of the solids, otherwise you run into different אב מלאכות such as possibly דש. Practically speaking, the point of liquid is that you are able to move things apart far more easily than you would with two groups of intermeshed solids. I think R’ Broyde’s position may be that every (?) raw food item should be suspected of being קלי הבישול unless we know otherwise. Food is “raw” until it is cooked to an edible state, and since roasted coffee beans are still inedible they are technically “raw” and potentially קלי הבישול. If that is his position then I respectfully disagree with the premise that foods are “raw” until they are cooked to an edible state; it seems to imply that the purpose of cooking is to make things edible, whereas in fact it is done to change the nature or quality of the food. Raw salmon, for example, is an edible delicacy – but we typically cook it because we also like cooked salmon, and cooked salmon is very different. Furthermore, coffee grains aren’t edible after they’ve been soaked in hot water, either. My understanding of your position is that you don’t think that בורר occurs in a French press when the stem is pushed down, because the coffee grains are still immersed in a sea of liquid coffee, and the liquid coffee is continuous through the mesh. When you pour the coffee out you’re not removing the coffee grains; you’re removing the coffee. My question is that if you could do the same with wheat or flour this would intuitively seem to be בורר. Why the difference, unless you argue that liquids are intrinsically different to particulate solids? Thanks Joe. I am not sure how one can do this to wheat or flour. Let’s give this example. I have a large jar of flour. Unfortunately, some ball bearings were in that jar and are now intermingled with the flour throughout the jar. I then get a large magnet and bring it the bottom of the jar (I know this is a silly example) and the ball bearings are attracted and are forced down towards the bottom of the jar. I then simply pour out the flour from the top into a container. I don’t think this is בורר because when you caused the separation of the ball bearings they were still intermingled with the flour, albeit they had undergone a process of סילוק effected by the magnet. Does this make any sense? Many thanks for your erudite compilation. I have pondered the same issue(s) – bishul afte afia, borer when the French Press sieve. (and so on) … I will be very pleased when I find an an halachic specialist who will say to me, “let’s see this device so we can understand it not just in theory but also according to *observation*”! Just to say thanks. This is an issue that I have thought about for rather a long time. I know those who use a french press (as a kli shlishi) to make tea with mint leaves (a standard drink in Israel) on Shabbat, forcing the leaves down with the press before pouring the tea. (The tea is made with tea bags, as per the p’sak of Rav Moshe Feinstein, zt”l.) The question of borer seemed obvious to me, and I wondered how it might apply to fresh press coffee. Thanks for the pilpul. I much enjoyed it. …and I guess for now I’ll stick to instant. 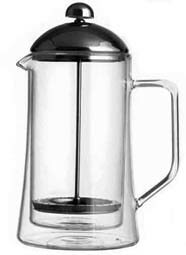 Personally, I still use a french press, though if the device indicated above is a better option, I might change. And what about pouring hot water over a pour over filter which leaves the coffee behind, something like this? I’m also not sure if that would matter, so long as the plunger is continuously pressing. Rav Aviner indicates that he does not agree to the point attributed to him in this posting. It would be useful to dig this correspondence out. Previous Previous post: Don’t they have anything better to do?